So, I had a blog here and stupidly cancelled the Godaddy hosting account it was on. Months ago. I thought it was hosted elsewhere (where it is hosted now) but I’d never actually moved it. Duh. So I’ll be re-posting content I am able to salvage from The Wayback Machine and Google cache. Looks like I’m going to lose about half the posts, which is a bummer. In the meantime, I came here to write my first post in months. It’s about practice. Welcome to Uke Nut. 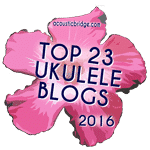 I started this website because I love the ukulele and, while there are many ukulele sites out there, this one is mine. I hope you enjoy it. I play mostly fingerstyle ukulele with an occasional strum & sing tune. I’m also interested in music theory as it applies to the instrument and using it along with rote memorization in getting to know the fretboard on an intuitive level. I’ll be posting what I learn here. We’ll see how it goes. Thanks for stopping by.